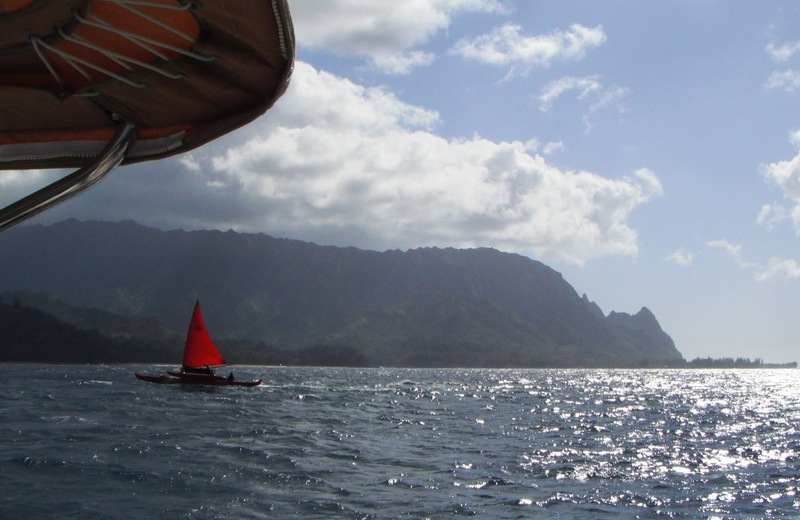 On Wednesday at 1600, we left Hanalei Bay. We hoisted sail inside the bay and set northward straight out to sea. It was really breezy and we felt like we were shot out of a gun, starting out fast right on our course. The plan is to sail 1200 miles north to 42 deg N 155 deg W and turn right. Our heading is 360 deg, but due to a strong west-setting current, we're making more like 350 close reaching. Since we're on the wind, it's been a bumpy and wet ride. Bill finally managed to close up all the leaks but one, the leak around the mast. It only affects the forward head and everything in there is plastic covered, so it's just a minor nuisance on this tack. But the cabin is nice and dry. Yay! The wind has been pretty consistent with only minor windy rainy cells. The sea state varies though, so sometimes the boat just keeps falling off waves with a bang making it hard to sleep, despite partially furling the jib to slow down. The temperature has been the most comfortable of any passage so far, probably 75-80 deg, (dunno for sure, the thermometer's kaput). We haven't seen much wildlife. Some of the returning Single-handed Transpac racers are 100+ miles ahead of us sailing back to the mainland too. So we've eavesdropped on their radio net a little. One racer crossed paths with a fishing boat one night and had to hail him on the radio presumably to avoid running into the gear towed behind. We have plenty of books and magazines. We bought Nook eReaders in Honolulu, and have lots of books on them, and also have the usual complement of audiobooks. So we have plenty to keep us entertained, when we're not eavesdropping on the "neighbors" but it's still boring. 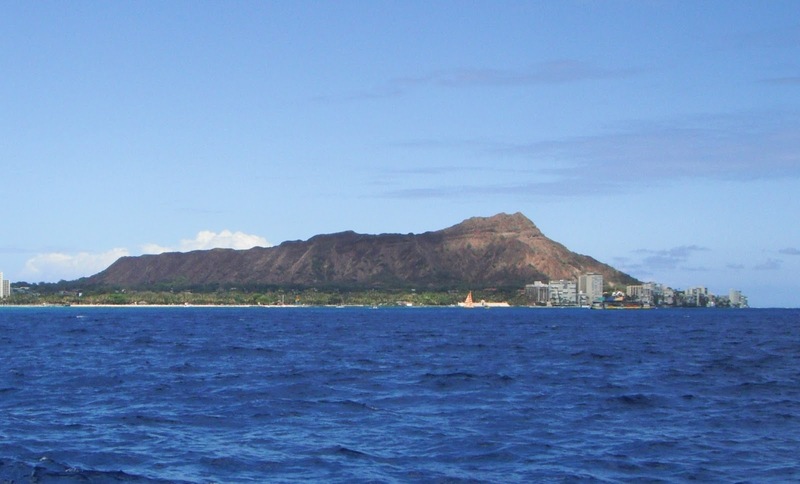 When we were online in Honolulu, I borrowed eBooks online from Seattle Public Library. However, they're reaching their 3 week expirations while we're at sea, so they are not all readable. Sorry for the blogging lapse: Our time in Waikiki was filled with mundane, mostly non-blogworthy chores. Kathi had a small flat nearby for a few days, so Bill & Kathi stayed ashore until Mark and Nance left on July 3rd. We broke out the bikes and put them to good use. Bill was able to bike to West Marine. We did find a relatively cheap rental car, so we had 4 big wheels (vs 4 little bike wheels ) for the last week of errands. It was nice to have the car to meet Seth when he arrived on July 17th. Hawaii Yacht Club was a happenin' place on the weekends with live music. We biked across the bridge to Waikiki Yacht Club a few times for drinks and wonderful dinner and brunch. The parts we ordered from the mainland arrived timely, and Bill replaced the throttle control and autopilot ram. He also replaced the leaky emergency steering cover in the stern. The jib foot needed a minor repair, which Bill was able to fix onboard. Mostly we worked on the boat in the mornings while it was cool and we then could go for a swim at a nearby beach in the afternoon. We ate out a lot and put on some weight. A number of Canadian cruisers passed through while we were there either coming or going from the mainland. Two were singlehanders: We were rafted to Silk Purse, (skippe r& crew Kirk) from Victoria BC waiting out an early cyclonic season en route to Japan. Jeanne Socrates on Neirada stopped by briefly during her 2nd circumnavigation. She's finishing her second solo circumnavigation en route to Victoria. Both have good blogs, Neirada has a link on 48 North's web site and Silk Purse is easy to google. Also a couple French boats stopped in and we had a good time with them. One, Zeecada, (Yves & Reine) is en route to Sitka, and we hope to see them again in BC in the fall. Nicolas and Gilberte from Reunion Island (west Indian Ocean) aboard Batt2, which they purchased in Seattle and spent several months moored next to the Fremont bridge. They plan to leave the boat in Hawaii while they go to Paris to rehab an apartment for 3 months later in the year. We're hoping they'll stop by Seattle on their way back to Hawaii in January so we can all go to the boat show as a family. We got lifted overnight, so we're making progress to the east of our waypoint 725miles N.
Weather is still really nice, including a few good rainshowers yesterday, everything else is still the same.....There's just not much to tell. I forgot to mention in my last post that we caught a 4ft wahoo at the entrance to Hanalei Bay as we arrived. I managed to freeze some of the fish and we gave away the rest to randomly selected boats in the anchorage. There's still some mostly frozen fish in the refer, so we haven't put out a line yet. Going forward, in an effort to catch smaller fish, we're going to try smaller tackle. The big ones are just too hard to handle and we can't store or eat very much of them anyway. We have plenty of books and magazines. We bought Nook eReaders in Honolulu, and have lots of books on them, and also have the usual complement of audiobooks. So we have plenty to keep us entertained, when we're not eavesdropping on the "neighbors" but it's still boring. We arrived at beautiful and calm Hanalei Bay Sunday afternoon. There were quite a few boats there, including a good part of the Singlehanded Transpac fleet. This included Moore 24s and Olson 30s. Amazing. We got acquainted with a few of the lads at sundowners on the beach. Adrian, on IDEFIX, (formerly MOF) from UW Yacht Club is planning to sail his Olson 30 on to Australia with his girlfriend and a guy friend. That ought to be interesting. Some of the competitors had buddy boats, non-racing cruising yachts that shadow the fleet. What a good idea! Hanalei is a wonderful anchorage. In summer, the ocean swells are small and few reach inside the bay. It's 20-40 feet deep with a good holding sand bottom, few wakes, beautiful beaches, little noise, easy shore access, garbage disposal, recycling and showers in the park and stunning scenery of craggy mountain peaks and gentle surf on the reef. There's a river to explore by dinghy, kayak or SUP (standup board) And a pretty good grocery store and restaurants easy walking distance from the dinghy landing. We hated to have to leave so soon. Also a couple French boats stopped in and we had a good time with them. One, Zeecada,(Yves & Reine) is en route to Sitka, and we hope to see them again in BC in the fall. Nicolas and Gilberte from Reunion Island (west Indian Ocean) aboard Batt2, which they purchased in Seattle and spent several months moored next to the Fremont bridge. They plan to leave the boat in Hawaii while they go to Paris to rehab an apartment for 3 months later in the year. We're hoping they'll stop by Seattle on their way back to Hawaii in January so we can all go to the boat show as a family.